Catch the free No. 35 City Circle Tram to Docklands (from Flinders, Spring, Victoria, Nicholson or LaTrobe streets) along Harbour Esplanade and Docklands Drive to NewQuay and Waterfront City. City Circle tourist trams run in both directions approximately every 12 minutes between 10am and 6pm Sunday to Wednesday and 10am to 9pm Thursday, Friday and Saturday. No. 86 – From Bundoora to Docklands Drive, Waterfront City via Spencer St, LaTrobe St and Harbour Esplanade. Southern Cross Station (formerly Spencer Street Station) is Melbourne’s main rail interchange for suburban, regional and interstate trains and is located right on Docklands’ doorstep. At Southern Cross Station, exit at the northern (Etihad Stadium) end to walk over the Bourke Street Pedestrian Bridge to Harbour Esplanade. Alternatively, exit the station on the corner of Spencer and Collins streets, and walk over the Collins Street Bridge to Docklands Park, Victoria Harbour. Metropolitan train lines that arrive and leave from Southern Cross Station: Alamein; Belgrave; Craigieburn; Cranbourne; Frankston; Glen Waverley; Hurstbridge; Lilydale; Pakenham; Sandringham; South Morang; Sunbury; Upfield; Werribee; Williamstown; and Showgrounds/Flemington Racecourse (seasonal). Regional train services that arrive and leave from Southern Cross Station: Warrnambool; Bairnsdale; Ararat; Swan Hill; Maryborough; Echuca; Shepparton; and Albury. Interstate train services also arrive and leave from Southern Cross Station. For information on train services operating outside Victoria, see the websites of Great Southern Railway and CountryLink below. No. 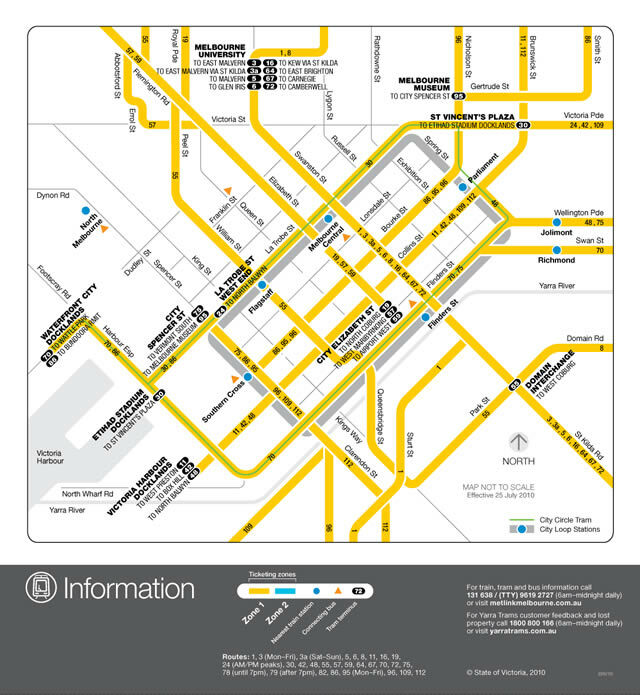 232 – Operates from Altona North to Queen Victoria Market via West Gate Freeway, Collins St and Queen St.
No. 235 – Operates from Fishermans Bend to Queen Victoria Market via Williamstown Rd, Collins St and Queen St.
No. 237 – Operates from Port Melbourne to the Queen Victoria Market via Lorimer St, Collins St and Queen St.
takes approximately 20 minutes and Skybus offers a free shuttle service between Southern Cross Station and 120 hotels across central Melbourne. For more information, visit http://www.skybus.com.au or call 9335 3066. Night Network provides a safe, easy and inexpensive alternative for travel after midnight on weekends. Night Network services in Docklands include trams 75 and 86, buses 941 and 942 and a 2am coach service to key regional centres departing from Southern Cross Coach terminal. The free tourist shuttle operates every 30 minutes daily (excluding Christmas Day) between 9.30am and 4.30pm and between 1pm and 4.30pm on Labour Day and Anzac Day. The free service takes approximately 1.5 hours, includes an informative on-board commentary and allows passenger to hop on and off the bus at any of the 13 stops at key city attractions. Docklands promotes the use of bicycle riding with about 15km of on-road, off-road and shared paths for riders. The Yarra Trail, Bayside Ride, Capital City Trail and Maribyrnong Trail all run into Docklands. Docklands provides bicycle hoops and drinking fountains throughout the precinct.